The gray granite rocks of the Beartooth Plateau provide a welcome change from the brown volcanics of the Absaroka Range to the south. This trail meanders near lake shores and through rounded boulders strewn across grassy meadows as though thrown by some ancient giant. The views don’t get much prettier than this. 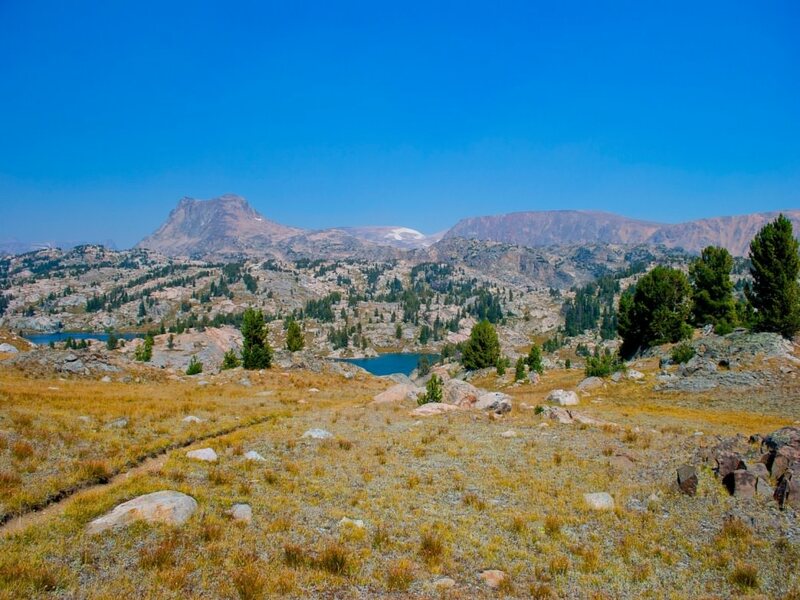 To get to the Beartooth Lake Trails (and there are many trails in this area), you’ll first drive first over the Chief Joseph Scenic Highway, followed by the equally stunning Beartooth All American Scenic Highway. There aren’t enough adjectives to describe these auto routes but the Beartooth Highway is often referred to as the “most scenic highway in America.” Besides being the scenic top, it’s also literally the top of the world as it navigates the high elevation of the surrounding 12,000’ peaks of the Beartooth Plateau. It’s the highest elevation road in both Wyoming and Montana reaching an impressive 10,947’. After feasting your eyes on the views during the drive in, you won’t be disappointed in the scenery along the trail. The trail takes in most of the views of the Beartooths and you’ll have an excellent chance of seeing the wooly white mountain goats that call this area home. This is a fairly easy, but lengthy hike and there’s not a lot of elevation gain. The views are incredible from every direction. There are lakes to fish, wildflowers to delight the eye and whistling marmots and pikas to tease your ear. The first section of trail winds through a swampy section. Be prepared to get your feet wet. You’ll head west towards the pines then turn northwest at 0.9 mile. Your feet will dry out on the rocky trail. At 2.8 miles you see the Beartooth High Lakes Trail sign where you’ll turn right. The High Lakes trail offers you views of alpine lake upon alpine lake. You’ll cross two creeks at 5.2 and 5.4 miles. These might be running high early on with spring runoff. Stay on the High Lakes Trail to climb a ridge and then hit the Beauty Lake Trail junction. Take Beauty Lake Trail back to your car. This is a good trail for families because there’s lots of water to play in, chances for fishing and all the wildflowers you could want. Bring extra socks for the kids. Beartooth Lake is a very popular spot for locals from both Cody as well as Red Lodge and Billings, Montana so there will be lots of folks out and about. The first mile of the trail can be fairly crowded but the further you go the fewer people you’ll encounter. Leave an extra 30 minutes early so you can stop in at the Clay Butte Visitor Center and Museum. You’ll get a chance to look around a restored 1940s era fire lookout tower and learn about the lost art of detecting forest fires. From Cody drive north on WY-120 to the Chief Joseph Scenic Byway turnout. Head left and continue on for 62.7 miles to the intersection of US 212 East, the Beartooth All-American Scenic Highway. 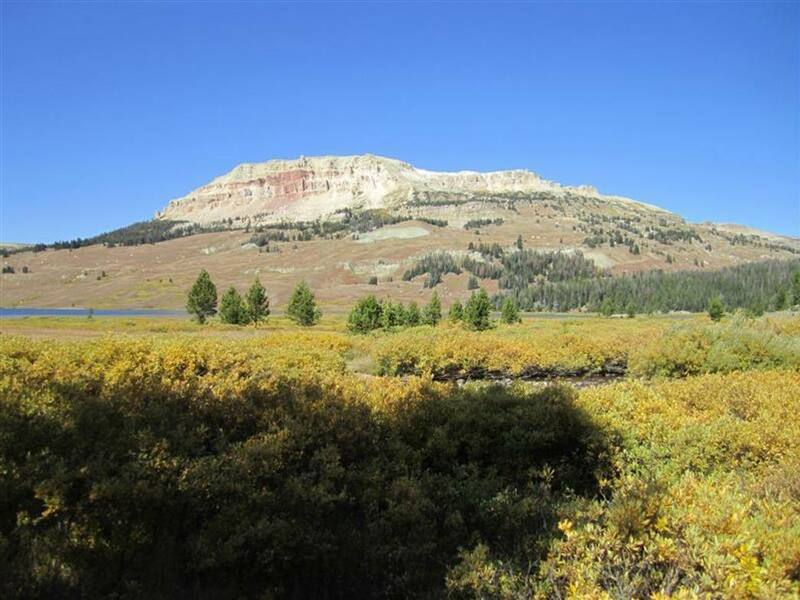 Drive east (right) to the Beartooth Lake Campground at 72.1 miles. The expansive parking area is past the campground another 0.6 mile. There are no fees and your leashed dogs are permitted. Be advised that all the water in this area means a very healthy population of mosquitoes. Bring DEET. There are fewer bugs later in August and September. Carry bear spray as well.